Here’s to a new year filled with health and happiness! As the year comes to a close and we begin to anticipate a brief Holiday hiatus, we would like to wish everybody the best during this festive season. We hope that all will be able to celebrate and enjoy their own special traditions with those they love – and perhaps discover a good book or two, as well! As a publishing company, we know how important books can be to those in need all over the world. This year, we made a donation to Room To Read on behalf of our clients and partners. Room to Read is an organization that delivers high-quality programs focused on literacy and gender equality in education across Asia and Africa. Our donation on your behalf filled twelve library shelves with books for children overseas who may not have the opportunity to read otherwise. To date, Room to Read programs have established more than 16,000 school libraries, built more than 1,800 schools, and published 1,029 original children’s book titles. Aside from this achievement, they also train teachers on literacy education and support young girls so that they are able to complete secondary school. Since their humble beginnings in 2000, they have distributed 14 million books and empowered 27,000 young women, benefitting more than 8.8 million children altogether. 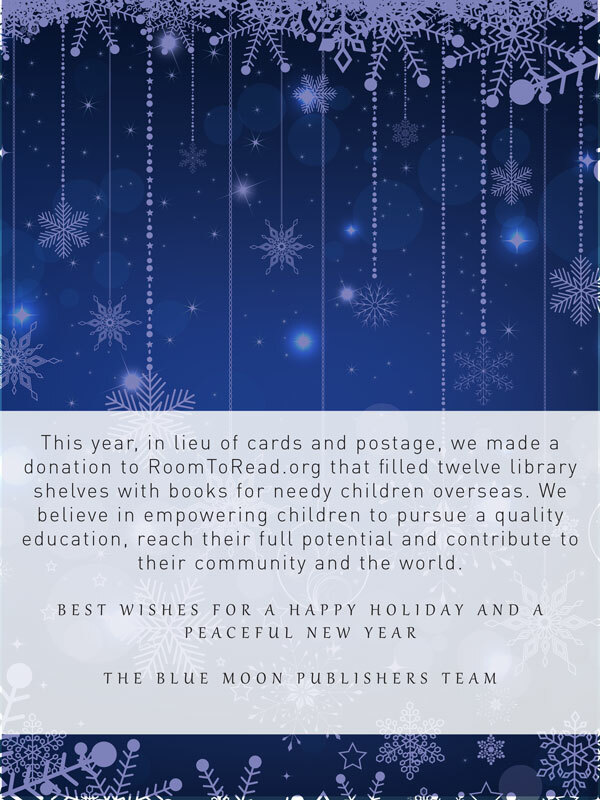 Like Room to Read, Blue Moon Publishers believes in a world wherein every child is able to pursue a quality education, reach their full potential, and contribute to their community and the world in which they live. Our office will be closed from Monday, December 22, 2014, to Monday, January 5, 2015. We will be checking in on social media periodically throughout the Holiday season and will be back full-time in January. Wishing you a joyful year to come.